Sketcher Constraints help us to position a new point coincident with an existing point, or to set the angle of a new line parallel with an existing line, and so on. This relationship is stored, and the actual position is calculated from the relationship. Draft Snap also helps us to position a new point coincident with an existing point, or to set the angle of a new line parallel with an existing line, and so on. However, only the new position is stored; the fact that this position was determined by a relationship with another object is immediately forgotten. 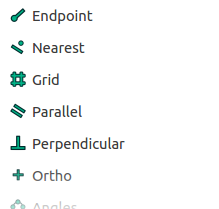 Notice that there is a lot of overlap in the available kinds of Sketcher constraint and the available kinds of Draft Snap. There are snaps that correspond more or less closely with each kind of constraint, and vice-versa. That should not be surprising. Both Snapping and Constraints have the same purpose: to determine the placement (position and/or orientation) of an object in terms of a relationship with either another object or the world coordinate system. The difference is that a constraint is stored in terms of its definition, whereas with snapping only the resulting placement is stored. 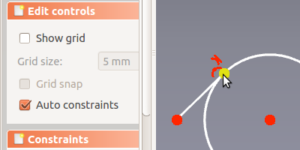 In Sketcher there is an auto-constraint option that produces a stored constraint automatically for some kinds of constraint, including coincident point, point on line, tangent, horizontal, vertical; but not parallel, perpendicular, equal length, etc. 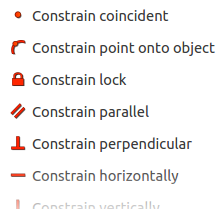 One or more icons appear near the cursor to indicate what kind of constraint will be produced. Sketcher also performs some limited snapping (to a point and to a grid intersection only, AFAICT). Like with Draft Snap, it just stores the resulting position (with no constraints applied) when snapping takes place and auto-constraint is not enabled. This is what I’d like to have. consistency between Draft Dimensions and Sketcher Dimension Constraints (both driving and non-driving). Snapping should be an easy, fast and intuitive method of entering most constraints.